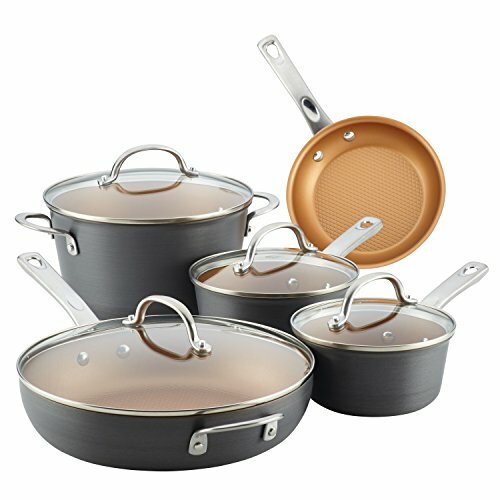 Aspire to your next level of kitchen cool and pursue your home chef passions with the Ayesha Curry Home Collection Hard Anodized Aluminum 9-Piece Cookware Set.This collection of essentials includes inspiring, pro-quality cookware for creating timeless traditional favorites and fun and easy weeknight family dinners or making a signature statement on new recipes for brunches, date night, or holiday get-togethers. Featuring saucepans in two sizes, a covered Dutch oven, and two skillets, gourmets and novices alike will be prepped and prepared to pull off Ayesha's Sweet and Savory Shrimp and Grits, Easy Pan Steaks or Olive and Mushroom Smothered Pork Tenderloin. Constructed from hard anodized aluminum, the cookware heats quickly and evenly and is twice as strong as stainless steel in modern, flared silhouettes. More than just a set of pretty pans, this high-quality cookware is heat safe to 500 Degree F and features double-riveted stainless steel handles and shatter resistant glass lids for confidence and cool, comfortable performance in the kitchen. Interiors boast an enhanced nonstick coating for long-lasting, effortless food release of even the gooiest recipes like Ayesha's Bananas Foster. Plus, this Ayesha Curry kitchenware helps support No Kid Hungry to provide up to 500,000 meals to children in need. Learn more at nokidhungry.org/onedollar. Set your sights on simple, easy, and soul-satisfying cooking with the Ayesha Curry Home Collection Hard Anodized Aluminum 9-Piece Cookware Set.